My 2016 Q5 breaks are squeaking very loud in winter. I went to the dealership, and I was told good breaking systems make squeaking noise. The brakes do not have any problem. I called Audi Customer Relations. I was told the squeaking noise was caused by a technical issue that cannot be fixed. Audi is still working on a way to solve the problem. However, nothing could be done right now. Does every Audi make the squeaking noise in winter? How come I haven't heard any car make the same sound? Below is some information I found on Audi's official website. It is so ridiculous. It seems to be somewhat of a common issue lately, but no, not all Audi make squeaking noise. Granted we have mild winters here, but my RS5's brakes don't squeak. Neither when I had the OEM brakes nor my aftermarket setup now. I drive a bunch of different Audis, too, and the brakes don't squeak, but those cars are relatively low mileage. However, I had a neighbor with an A5 and his brakes squeaked like hell whenever he pulled out from his driveway. It was ear piercing, but luckily he moved away recently. My B8.5 S5's brakes squeak when the temp outside is below freezing. Otherwise, they're quiet. As you probably know, Audi's and Porsche's share some components especially the brakes so it is safe to say that the Porsche video is also relevant to Audi's. 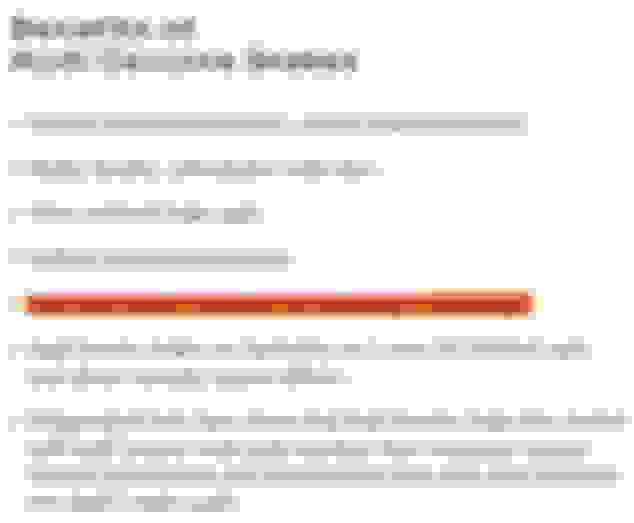 Last edited by plat27265; 02-26-2018 at 09:40 AM. To be fair the brakes on a Porsche are on a different level than the brakes on mainstream Audis. So are the brakes on an RS and the R8 for that matter. Since we are posting videos, I've posted the following one before and I made this point on similar threads. Key to optimal brake performance and noise reduction is the process of bedding aka burnishing the brakes. The more performance oriented the brakes, the more important this process becomes. 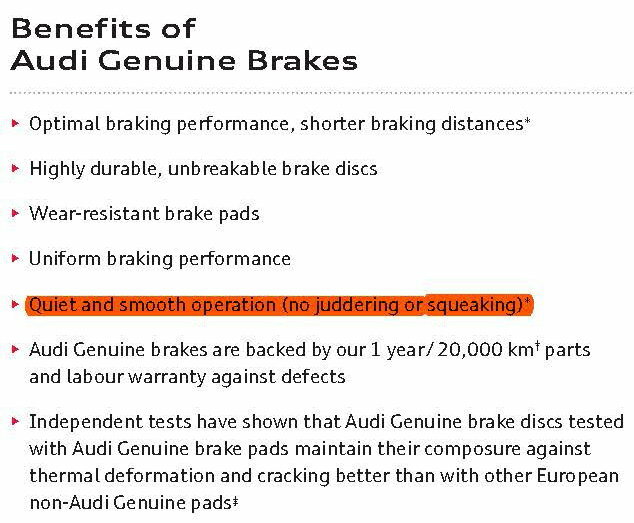 My breaks squeak very loud, but I think Audi cannot do anything to fix them. I guess I'm just unlucky. Take the car out on an empty road and do a few hard stops w/o coming to a full stop, then let the brakes cool w/o resting your foot on it. I bet you the noise will be gone or significantly reduced. Repeat if the noise comes back. Our 2017 Q7 makes terrible noise, and we really don't have much "winter" in Los Angeles. I also called Audi corporate was given the same excuse "We are aware of the problem, and Germany is working on a fix. We'll put you on the list for when a fix comes out". I suspect the lease will run out before they fix the brake problem. I have a 2016 A6 which makes no brake noise.... not like the Q7, which I can hear inside our house when my wife comes home and parks in the driveway, so it's not limited to cold brakes. Never had any other German car make brake noise like this.... past cars include: BMW X5, MB E320, and two VWs. After complaining with a manager, the dealer agreed to replace both front and rear brake pads under warranty. I hope my car will not make loud squeaking noise tomorrow morning. Do your brakes squeek when not pressing brake pedal? Do any of you with squeeky brakes notice it happen first thing in the morning when you are pulling away and not touching the brake pedal? I recently noticed a squeek and it is definitely related to wheel speed and varying during each rotation, as with a slightly warped rotor. It only happens at the very beginning of a drive and is is louder if I ask for brakes. But it happens even when I am gently accelerating either in a straight line or while turning and with no braking. I notice it in underground parking garages where the sounds echo around. I have tried reproducing the sound after driving the car a few miles and did not hear any squeek then. I think I have heard it a few times leaving work, so it doesn't strictly have to sit all night to develop the squeek. But, I'd say it is louder in the morning. Ours is a 2017 Q3 with only 13k miles on the odometer. It lives in coastal Los Angeles with high humidity and "salt air" but mild temperatures. Its life is a mix of very short city driving for weeks/months interrupted by 300+ mile highway and mountain road trips during all seasons. Does this squeeking sound typical or problematic? I understand all the talk about squeeky brake systems and possible corrosion of the discs, but I don't quite understand why it would happen without pressing the brakes. I wonder if the Audi system does some kind of calibration where it might be lightly dragging the brake calipers itself on cold starts? Or should I be concerned that something like the electronic parking brake is not fully disengaging when cold? Quick Reply: Does every Audi make squeaking noise in winter?